Chrysocephalum apiculatum, an Australian native is widespread in Australia in many climatic zones. ‘Desert Orange’ selected from a breeding programme is long lived like it’s parents and thrives in gardens or large pots. Flowering on new wood all year long in South East Queensland,* ‘Desert Orange’ gives a blaze of colour with the best specimens growing in full sun positions. Nearer to trees it becomes more open but still gives a show. Once established very little water is needed to keep the plant alive with great resurrection following rain. *( Note:- In Central Australia flowering in Spring and Summer is the norm). Chrysocephalum apiculatum grows in nature in parts all states of the Commonwealth. Coming from such a wide diversity of climate and soil type it varies considerably in growth habits. The breeder of ‘Desert Orange’ , Dr. Kerry Bunker selected from these many forms and cross pollinated by hand the ones with desirable characteristics. From the many hundreds of resultant seedlings ‘Desert Orange’ was chosen for its’ superior growth and massed flowering. It has a close relative ‘Desert Flame’ which is well known and has been on the market for several years. ‘Desert Orange’ is a perennial. It will grow to spread from the crown to a width of 0.5m. The plant is described by the Australian National Botanic Gardens, Canberra as decumbent which means that the stems lie flat along the ground with the tips which bear the flowers turning upwards to a height of 15cm. ‘Desert Orange’ is used as a ground cover plant among trees and shrubs or as a border in open garden beds. If planted above a retaining wall it will spill down the wall bearing masses of small golden heads which contrast well with the green leaves. In garden containers ‘Desert Orange’ will cover and spill over the sides of the pot. It makes a waterwise pot plant but needs watering on average two or three times a week. 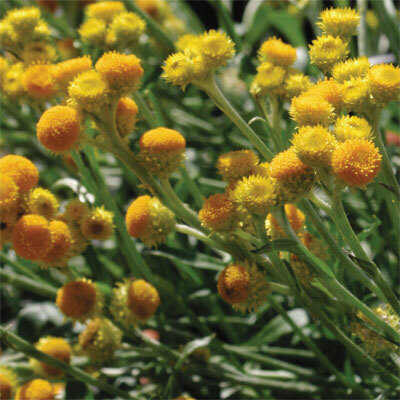 All Chrysocephalum are easy care plants and ‘Desert Orange’ is no different. If you decide to grow your plant in a large garden pot then purchase potting media with good humus content. Slow release fertilizer periodically keeps the plant growing well. Prune when the plant gets to look a little tired. Severe pruning can be undertaken, ‘Desert Orange will soon shoot away from the central crown. When grown in your garden mulching at planting is really beneficial to assist the plant to establish and thrive. Roots are kept cool and moisture is better retained by the mulch. If needed, pruning as explained in pot culture earlier can be severe with the plant soon shooting away again. The plant is generally free of pests and diseases. Reference: Australian National Botanic Gardens publication, Chrysocephalum apiculatum.